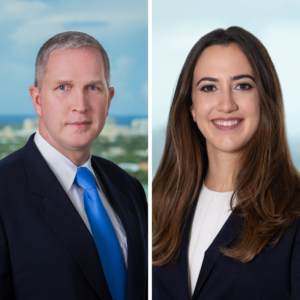 On December 14, Fort Lauderdale partner Edward O’Sheehan and Miami associate Alina Gomez successfully represented a father in the trial of a pro bono case under the Hague Convention on the Civil Aspects of International Child Abduction. The case was referred to the firm by the U.S. State Department. The Shutts client, a Peruvian father, complained through the Peruvian government about his ex-wife illegally taking their son to the United States despite the existence of a ruling from the Peruvian Supreme Court in the father’s favor. The federal judge ruled from the bench at the end of the trial and the father traveled back to Peru, with his son, within one week of the ruling in his favor. Shutts & Bowen has handled a number of Hague Convention Child Abduction matters, referred to the firm by the U.S. State Department. The cases proceed on an expedited basis through federal court, typically lasting a few months. Edward O’Sheehan is a partner in the Fort Lauderdale office of Shutts & Bowen LLP, where he is a member of the Business Litigation Practice Group and Chair of the firm’s Pro Bono Committee. Ed has over 19 years of litigation experience in consumer finance litigation, creditors’ rights and bankruptcy, condominium and homeowner association litigation, probate and guardianship litigation, insurance matters, and tax appeals. Ed also provides representation for clients in matters involving The Hague Convention on the Civil Aspects of International Child Abduction. Alina A. Gomez is an attorney in the Miami office of Shutts & Bowen LLP, where she is a member of the Business Litigation practice group. Alina’s practice focuses on general and business litigation matters.